we know i love me some craigslist. props to my amiga katie erb for finding this gem. i am filled with greenish jealousy for anyone who lives in Seattle! 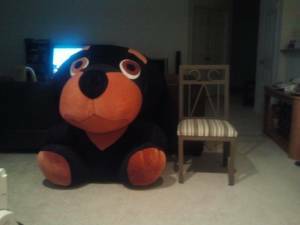 Big stuffed dog must go tonight. if you are interested please be able to pick the dog up tonight!!! It is too big for a car. Bring van or truck. Craigslist is awesome, some days I browse it just when I am bored, and then send funny things to all my friends. hahahaha that would look uh-mazing in the condo.